As much as we like to give Kickstarter campaigns a hard time (or just outright laugh at them), we've seen some cool ideas come to fruition thanks to crowd-funding. 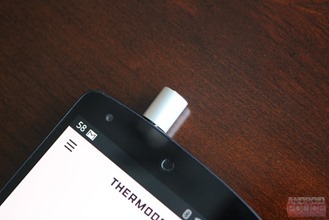 Among those, Thermodo is an interesting little gadget: it's essentially a small thermometer that plugs into a phone's or tablet's headphone jack and interacts with the device through an app to give the temperature of the current location. 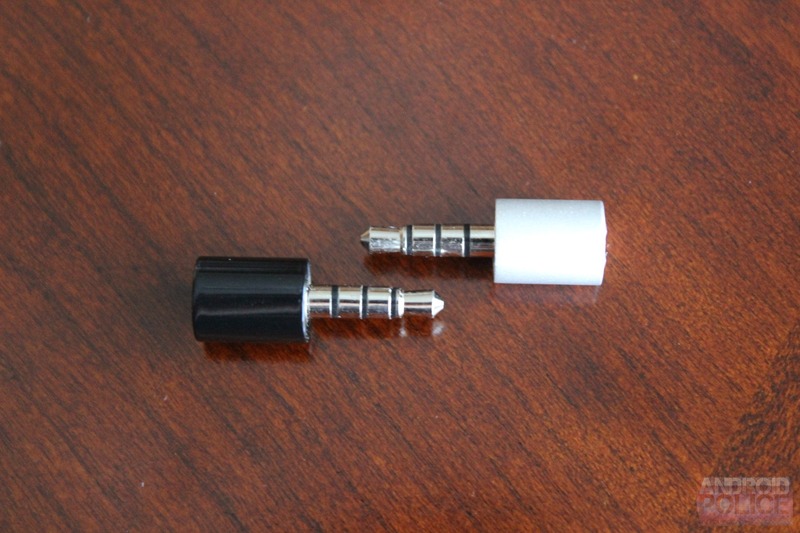 I'm not entirely convinced of its practical usage, but the idea is definitely neat. And let's be honest here - nearly everyone has some sort of weird fascination with the temperature (or the weather in general). I definitely do. I've had both the the "regular" ($30) and premium ($45) Thermodos for the last few weeks and tested them on various devices, including the Nexus 5, Nexus 7, and *cough* iPad Mini. While I initially expected the experience to be pretty straight-forward (plug it in, launch the app, get the temp), that's actually not the case. 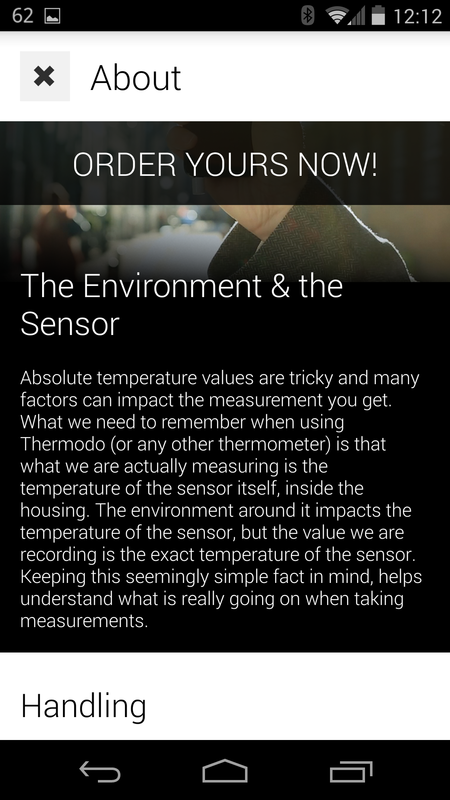 There's a slight learning curve to using Thermodo, and it takes a bit of tweaking to get what's assumed to be an accurate reading. 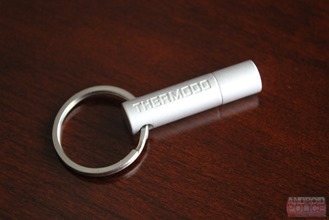 Aesthetically, Thermodo is a little-bitty thing with a very simple design. It's basically just a plug with slightly large end, which is naturally where the unit's internals are found. 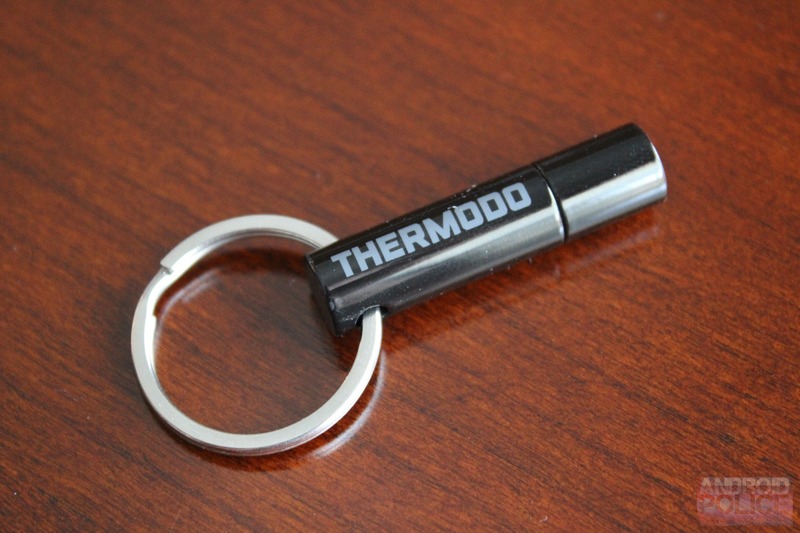 It weighs only seven grams and comes it at almost an inch and a half in length (including the protective "sleeve"), so it's easy to throw on a key ring without really getting in the way. The "regular" version of Thermodo comes in either black or white, and features a machined aluminum body with a scratch-resistant coating and hand stamped logo; the premium model has an anodized surface and engraved logo. That's literally the only difference between the two - they both function the same way. It's all about getting the one that looks best to you...though the premium edition is $15 more than its "basic" counterpart. For the same thing. Not really sure it's worth the extra dough. 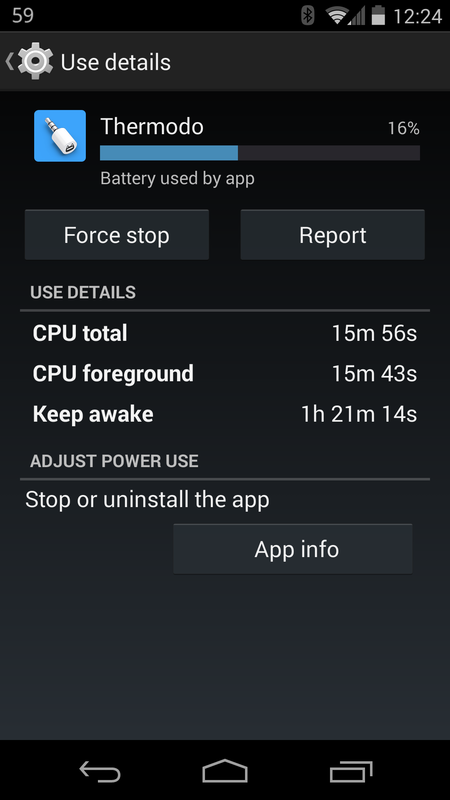 When it comes to functionality, it's really kind of hit and miss depending on the device you're using. 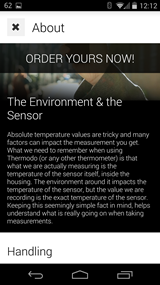 There are several different variables to consider, with ambient heat being the most prevalent. Since each device is different internally (even down to the headphone jack itself), you can pretty much guarantee that each one is going to spit out a different reading. As I stated in the intro, I used primarily three different devices for this review (and even tried it out on a few others), and every single one of them provided a different result with the stock settings. That's frustrating. Fortunately, there are certain things you can do to ensure the most accurate reading for your device. 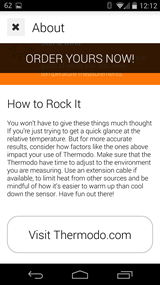 During what I'd consider to be a calibration process, it's best to be in a room where the temperature is controlled and you can check the reading. For example, my house is kept around 72, but I did most of my testing in my home office, which is always hotter than the rest of the house because of the lights, computers, monitors, and TV that are essentially always on. I imagine it's closer to 74 or 75 in here, which is what I went with when trying to get the spot-on temp with Thermodo. It's also worth noting that I used the same process for all of my testing devices. 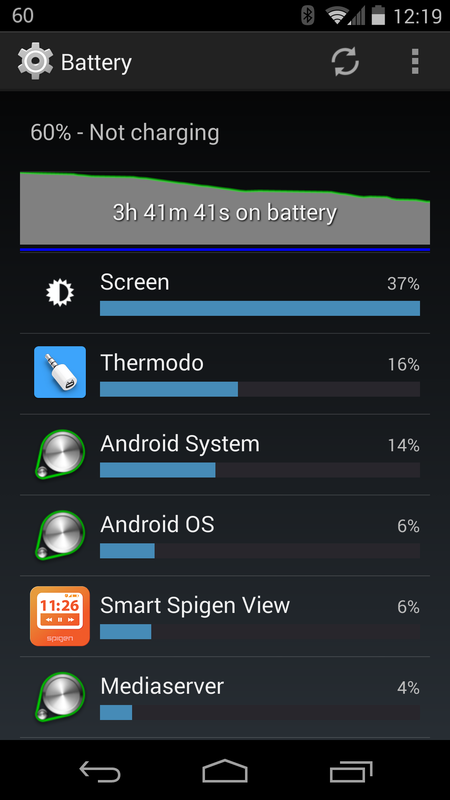 Firstly, I just popped the Thermodo in and let it do its thing. It takes several minutes for it to produce a steady readout, so leaving it alone for a few minutes (I'd say two to five) is the best option initially. This gave me a good idea of how high the reading was going to be. 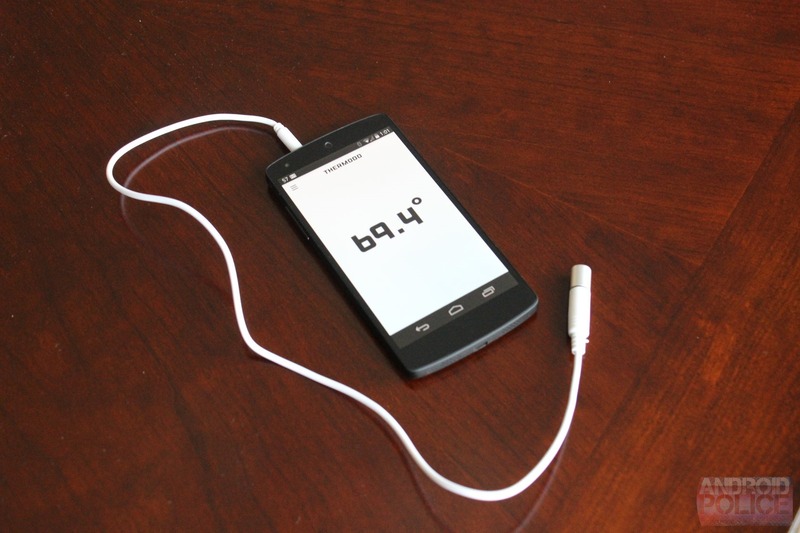 After that, I grabbed an audio extension cable and plugged Thermodo into it. This essentially negated the device's ambient heat to provide a more accurate reading. Sure enough, after just a few minutes the difference was pretty drastic - easily upwards of five degrees. With the extension cable, it settled at around 75.4, which I feel like is probably pretty accurate where I'm sitting. 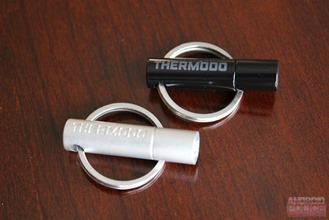 After that, I removed the extension cable and put Thermodo back into the port by itself. 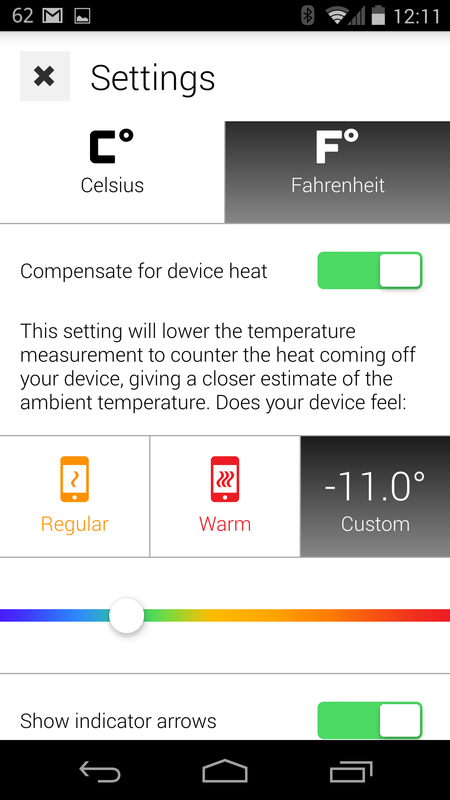 In the app's settings there's an option to compensate for device heat, which offers a couple of generic options (regular and warm), along with a custom setting. I gave the unit a few minutes to adjust, then started tweaking till I got a similar result to what it showed when using the extension cable. 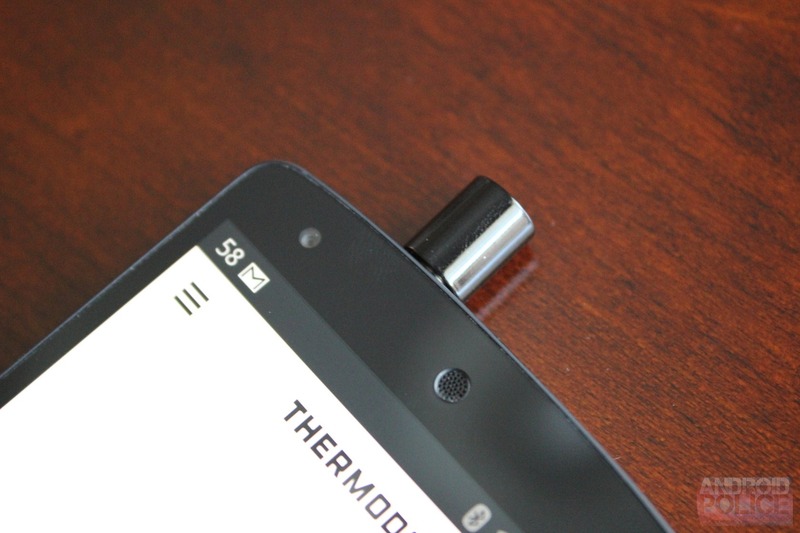 Turns out for the Nexus 5 the difference is about 11 degrees Fahrenheit. For the Nexus 7, it's about 6.5. The iPad Mini reads at about a two degree difference. It really all depends on the device. Of course, that's not a foolproof system: it's possible that the sun will heat up a black device quickly, thus raising the ambient heat by a few more degrees. 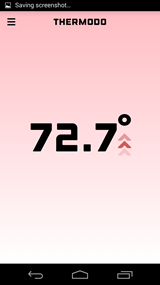 I didn't actually get that effect when I tested it here, but it hasn't been "Texas hot" yet, which I feel like would be required before affecting the readout post-calibration. Honestly, though, I think the most accurate reading is always provided with an extension cable and no heat compensation within the app. 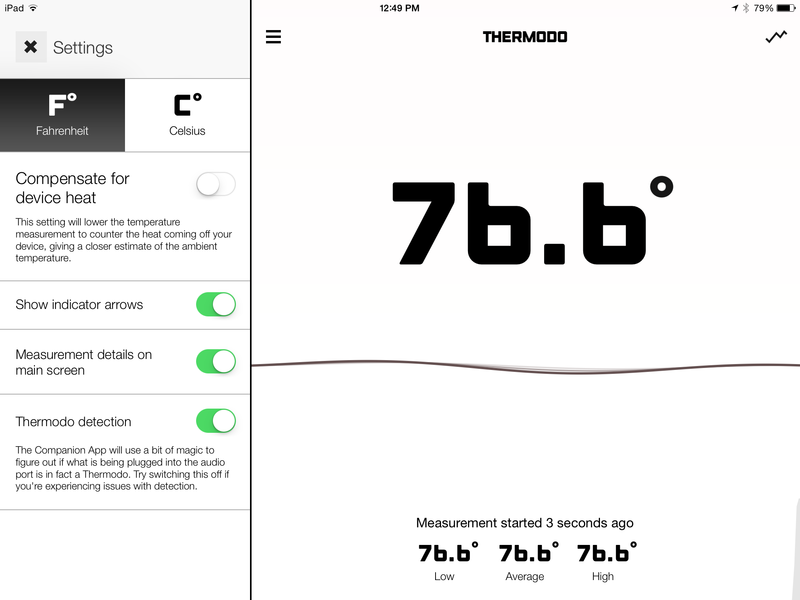 If you want to use Thermodo for precise temperature readings, that's the only way to go. 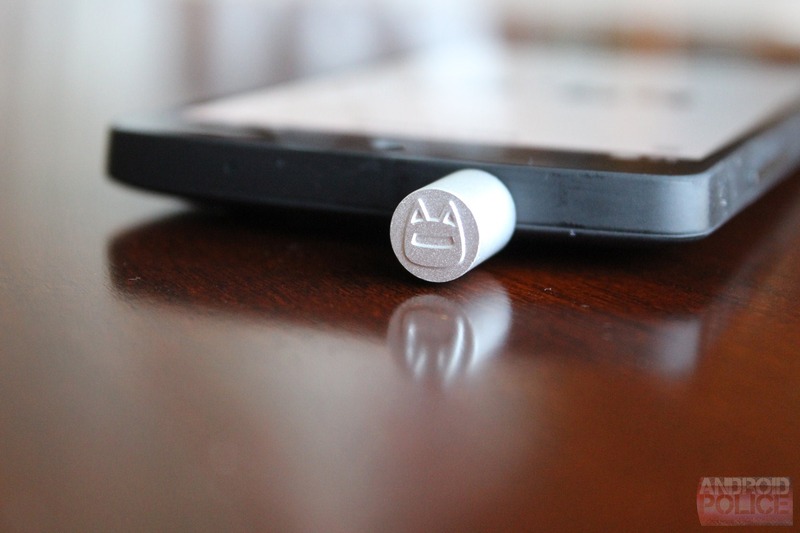 For quick and dirty readings, just shoving it into the headphone jack will do the job. The app itself is incredibly simple: it shows the current temp, along with some subtle indicators that show whether it's rising or falling. Very, very simplistic. The settings menu is equally as simple, with just the must-have options: Celsius/Fahrenheit toggle, heat compensation, and the option to show the indicator arrows for which way the temperature is going. Bare-bones. 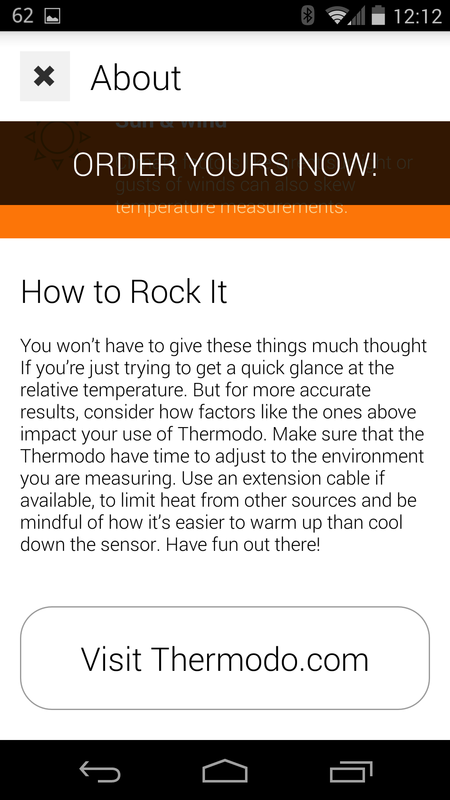 The "about" menu has some good advice on getting the most out of Thermodo, which comes in handy when figuring out how to use it. Unfortunately, the Thermodo guys also chose to offer one app for Android tablets and phones instead of a scalable interface depending on the type of device. The iPad app's interface is much better than that of Android tablets like the N7 – it shows all the info, including settings, on one screen. There's so little to the application, this is easily the most effective way of laying it out on a larger screen, and I would really have liked to see the same interface on the Android tablet app. The iOS app also has some nice little animations and additional features not found on Android, like a low/average/high readout. 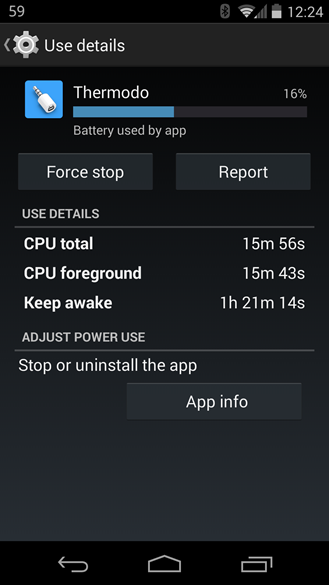 It's beyond obvious that more time was spent on the iOS app than Android, and the latter was just thrown together to get something out the door. Not cool, guys. Not cool at all. Thankfully, that can be remedied in an update. 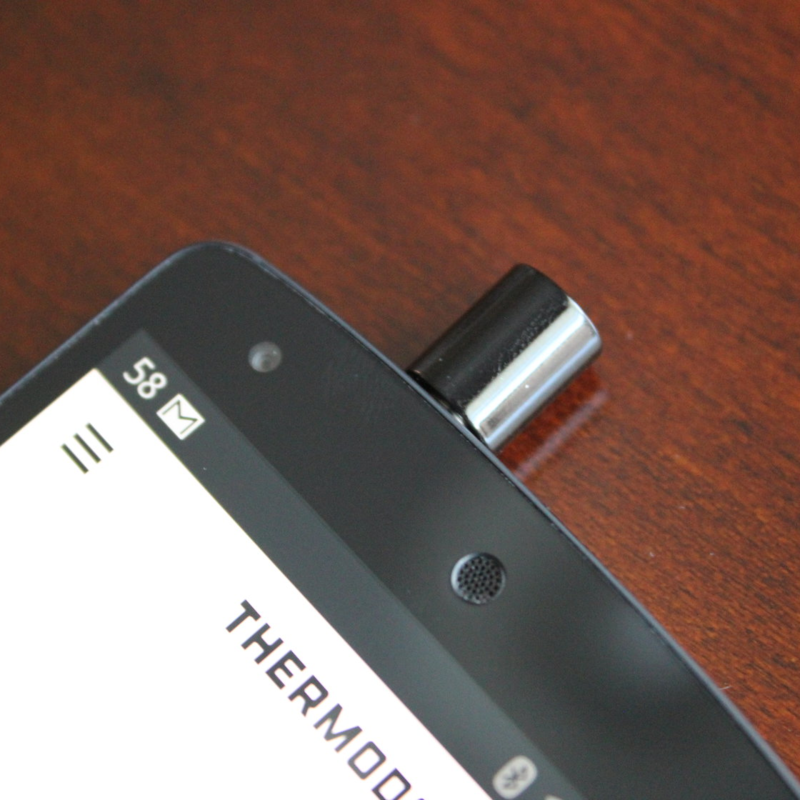 Overall, I think Thermodo is a fun little novelty accessory. 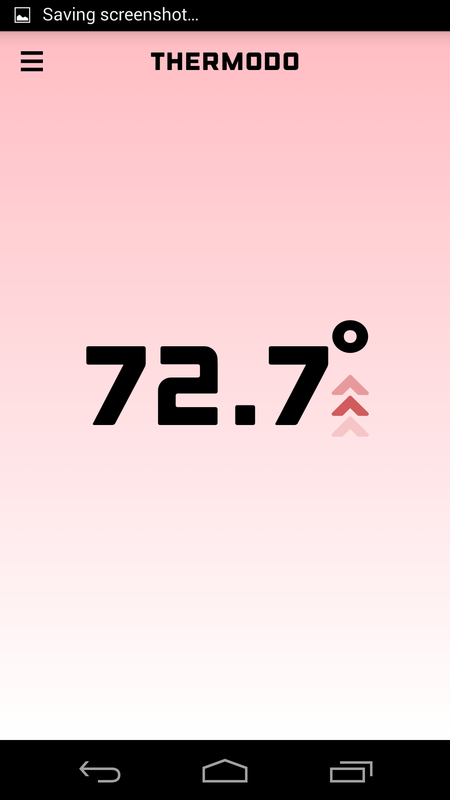 It probably won't have any "important" real-world use, but it's a neat little thing to plug into your phone and get a quick temp readout for...whatever reason. Whether or not it's worth $30-45, however, is another story altogether. If you have some funds to throw away on something you'll probably only use for a like a week then never think of again, then by all means, pick one up. Otherwise, I'm not sure I would say it's worth the purchase without a good reason...which probably doesn't actually exist. So, just buy one if you want it.